Succeeding in school can be a challenge, but if you are a student with hearing loss, the path to getting a great education may be even tougher. 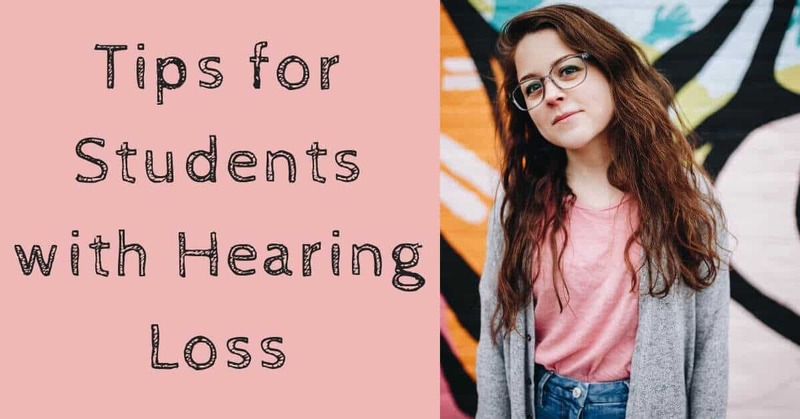 While many schools have resources to help students with hearing loss thrive, hearing can still be an issue, especially in classes that are lecture or conversation driven. Here are a few tips for attending school with hearing loss. Sometimes it can be hard to disclose your status as a student with a disability. However, letting your teachers and administration know that you have hearing challenges can open many doors and make the learning process easier. Disclosing your hearing loss is a personal decision, but letting an instructor know the challenges you face in learning can help them develop accessible teaching methods and better ensure you are able to keep pace with the classroom activities. Talking to course instructors can also help you get a sense of what you will need to consider to hear your best in the classroom. If you are attending a large lecture course, for instance, talking to the teacher ahead of time can prepare you on where to sit to best listen and whether lecture notes or even the written lecture text can be made available to you beforehand. Most schools are able to provide some assistance to your learning if you talk to them about your hearing loss and let them know what can be done to best accommodate it. Some universities and colleges may have telecoil loops available for large lectures that can stream sound directly to your telecoil-equipped hearing aid. Other assistive devices and text captioning of classroom speech may also be available. Talking to your school means that they can work to improve your learning experience. Look for school administration that run student services or disability access for your school and talk to them about how they work with students with hearing loss. Disclosing your hearing loss is a personal decision, but choosing to do so can make your educational experience much easier. Where you sit in a classroom is important to how you hear, so consider where you place yourself in the classroom. Sit close to the instructor, or, if a PA system is being used sit close to a sound source. If there is class discussion, try to position yourself where you can see everyone’s face to help pair the speaker with their voice and help interpret what they are saying. Avoid architectural challenges in the classroom. Don’t sit near vents, windows or doors where frequent noise can get in the way of your studies. Having your back to a wall helps absorb background noise and will better help you source the direction of conversational sounds and understand it more clearly. If you are sitting in a place in the classroom where hearing is difficult, change seats or ask your instructor to re-assign your seating to a better spot. If you have let the teacher know you have hearing challenges, they should be happy to move you to encourage your learning. Some of the obstacles of the classroom can be overcome with classes that are entirely online or involve a heavy amount of online work. Many online courses use subtitled videos, texts and slide presentations and rely on typed “chatting” for student discussion. Online classes let independent learners work at their own speed and can accommodate hearing issues smoothly. Online learning usually becomes available at the college level, but more levels of online classroom experience are becoming available each year. Online tutorials and classes can also offer an interactive learning supplement to in-person classroom learning, allowing students to access concepts in a non-auditory way. If you haven’t looked into treating your hearing loss, starting the school year is a great time to see how hearing aids and other assistive devices can help you manage hearing loss. Modern hearing aids are compact and powerful technology that is custom programmed to help your hearing. Added to this, most hearing aids are astonishingly discreet, being nearly invisible to the casual observer. Want to get on the path to better hearing? Roseville Diagnostic Hearing Center can help. We offer hearing solutions for every need and lifestyle and work with you to find the best way to manage and overcome hearing loss. Ready for the next step? Contact us today for a hearing exam appointment.